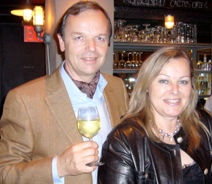 Beate and Rolf Boeni take care of design and Internet (Beate), and of business plans and finances (Rolf). The gourmet kitchen is again one of Beate's responsibility. Beate came originally come from fashion design and the fashion trade area, while Rolf is from the financial sector.